"When will this chatter come to an end?" - asks Capricorn, who often does not see the need for talking, especially when busy with an important matter - for example, climbing a mountain. Capricorn also does not come to mind opening his mouth, just to make some banal remark - for example, but about cleaning potatoes. Such questions are unworthy of reflection, and even more so of discussions, but little Gemini is seriously occupied with important problems: why the shape of potatoes are different? Why does a tuber cover the peel? The world of Capricorn is divided into what matters, and the fact that this value is deprived. Curiosity Gemini knows no boundaries, no relativity. For him, everything and everything in the world is equally interesting - but only for a short time! Capricorn is inclined to strictly adhere to the schedule, which is a plan. Gemini is allergic to the regimen and schedule, so there may be disputes in the family about whom, what, and when to do it. It’s amazing how quickly the little Gemini is able to "forget" about what you’ve been telling him, despite his mental abilities. But even if Gemini promises to do something, and with the best intentions, he is able to distract himself at a critical moment: this clearly shows that it is not in his nature to prioritize priorities. A sensible Capricorn Mom does not always keep up with his little restless Gemini. He overcomes her with questions, humming something, starting all new games, sometimes too noisy… Maybe it’s all funny, but she just gets tired of it! Capricorn wants her twin to look more like an exemplary child. True, no one denies his mind, and she is pleased. She will try to ensure that he is the best in school, and will help him, making him work harder and make fuller use of his potential. But the mother should not put too much pressure on the child, because this will only deprive him of his ability to spontaneously act, and hence, to creativity. It is quite natural for Gemini - to jump from one subject to another, when he is bored. But Capricorn’s mother believes that vigilance is needed in everything, and gets angry if she thinks that he is wasting his time. Gemini loves all kinds of ideas, words, endless conversations and entertainment, while his mother prefers hard work and wants her to have a good reputation. Mothers will have to understand that Gemini can do things faster and easier than she does, and that he simply does not care what others think of him. The mother takes with caution both new methods and new ideas, which so attract Gemini. And her dry humor is not always compatible with the play of his words. And yet the mother will admire her Gemini, because there is so much liveliness, curiosity and interest in life! She likes his self-confidence and how naturally he fits into any society. And his ability to speak simply amazes her. But what she will not tolerate under any circumstances, so this is his too free treatment of facts! She will try to ensure that Gemini adheres to its path, and will always give him wise advice, if necessary. And it will help to realize his best ideas. Moreover, her child is not so difficult to succeed - you just need to concentrate. Capricorn dad with his business mindset hopes that his child will be an example for all, that is, serious, hard working, prosperous and wealthy. Gemini can really fit into life. He seemed to be born to be known by all, and easily establishes any contacts. True, he will not have much ambition, unlike his father. His main goal in life is to have fun. The more fun, the better! 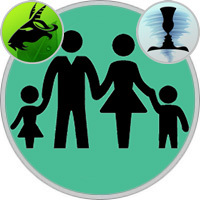 Capricorn will have to understand that his child-Gemini looks at things with different eyes, otherwise large collisions are inevitable between them. The twin flutters from passion to hobby, leaving unfinished projects and constantly looking at something new. Capricorn believes that you need to stick to the end of something one, and does not show much interest in the most modern trends. Capricorn most of all loves his house, although at times it seems so cold, as if the family’s affairs do not concern him. Gemini does not like to sit at home much, preferring to meet with a wide variety of people, enjoying the rich social life and the warmth of lively conversations. For Capricorn, an appearance in society is simply a way to strengthen one’s reputation. He appreciates those acquaintances who would help him to climb the social ladder even higher. Neither of these two is very emotional, so they do not usually show their feelings or make noisy scenes. True, my father should be more careful: Gemini can pretend that he does not care and that he does not feel any feelings, although in fact it is not. Gemini wants recognition. He expects everyone to appreciate his imagination, interesting stories that he likes to tell, his wit, wit and readiness for adventure. And if the father allows him to be himself, you can not wish for better.